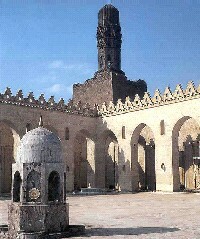 Al Hakim Mosque is the second major Fatimid Mosque and the fourth most important religious edifice in Egypt. The articles provides an elaborate account of the Fatimids contribution to its rich architectural design. 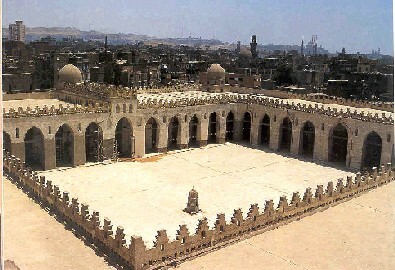 Al-Hakim Mosque was built following the tradition established by the Ibn Tulun and Al-Azhar mosques. 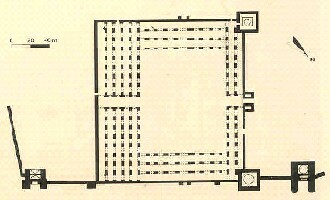 It emulated the building forms and techniques of the former and the spatial configuration of the latter. The mosque's history and magnitude made it the second major Fatimid Mosque and the fourth most important religious edifice in Egypt after the mosques of Amr, Ibn Tulun and Al-Azhar. The reign of the Fatimids was somewhat controversial. The succession of this dynasty to the Caliphate has been accomplished on the ruins of the Abbasid state, a period which saw much of the Muslim civilization's glories and progress. The Fatimids are also accused of being too soft with Crusaders, in some instances accused of collaborating with them to end the Seljuk rule in the Levant. Whatever their political motives and dealings were, the Fatimids left a considerable architectural and artistic heritage highly admired by historians and collectors. This brief article assesses the Fatimid architectural contribution in Al-Hakim Mosque which was built between 990 and 1012. Although started by Caliph Al-Aziz in 990, the mosque, as referred to in the name, was completed by Al-Hakim Bi Amrillah (the ruler by the orders of God) who ruled between 996-1021 inheriting the throne from his father al-Aziz (975-996) and grandfather, Caliph Muizz (953-75). However, unlike his predecessors, he was accused of brutality, torture and assassination of his rivals and in turn, he was himself assassinated. Originally built outside Cairo's northern wall, the mosque was incorporated within the city in 1087 transforming its own northern wall and minarets into an integral part of the fortifications. Al-Hakim, or more precisely Al-Aziz, reused the plan of Al-Azhar mosque with a five aisled prayer hall (sanctuary) and arcaded porticoes. The central nave in front of the mihrab was enlarged and raised higher above the roof accentuating its importance and it was pierced with clerestory windows as at Al Aqsa in Jerusalem. The mihrab itself was defined by a semi-circular dome raised on squinches and standing at the centre of two corner domes of similar design. The trio were clearly introduced to emphasize the Qibla wall. Historic sources indicate that Al-Azhar, built two decades earlier, had similar arrangement with three domes on the Qibla wall. Rivoira who studied the dome of the mihrab concluded that it has retained its original form although there were traces of later restoration work, mainly brick work undertaken during the restoration carried out by Baybars in 1304. However, Rivoira probably went too far in suggesting that the dome form and character was derived from a Roman Sicilian tradition as having "typically Ravennate pendentives", a reference to the church of Ravenna. The influence of Ibn Tulun Mosque can also be felt in many architectural elements of the Al-Hakim Mosque. The arches supporting the arcades of the sanctuary (prayer hall) as well as the portico were built pointed in Tulunid fashion on robust masonry piers with engaged columns at the corners. In relation to the original features introduced by the mosque, one can refer to the distinguished façade and its two corner minarets. To create a balance with the apposing sanctuary end, Al-Hakim ordered in 1003 the construction of a monumental façade at the north western end of the courtyard. The centre of this façade was pierced with an imposing masonry gateway of tripartite design unfamiliar in Egypt at that time, but greatly resembling the entrance portal of the Great Mosque of Mahdiya (Tunisia, 916 CE), the first Fatimid capital. These features had considerable impact on the evolution of façade architecture in Egypt, especially on Cairene streets. Further influence of the monumentalisation of this entrance is connected to the rise of the highly emphasised portal entrances of the 11th and 12th century Romanesque gateways. It is true that the Romans used mainly monumental arches for the celebration of particular victories but they did not attach them to buildings. Furthermore, it has been established beyond doubt that the example of Mahdiya to be indeed the first recorded prototype of such entrances. With their close connections with the Normans in Sicily, the Fatimids played an important role in the transmission of many Muslim architectural themes and techniques to Europe including the use of porches at entrances. The other original feature of the mosque consists of the two minarets, which despite the newly added sections they represent the oldest surviving examples of the Fatimid period, both raised high at the corners of the north western wall but of differing designs. The minaret of the western corner was erected first on a square substructure changing later into an octagon above the height of the surrounding walls. The minaret of the northern corner was built cylindrical on a square base, contrasting with the rectilinear nature of the rest of the building. In an attempt to address this problem it was decided, in 1010, to build a square salient around the minarets to conceal the imbalance. Another encasement was built around the northern minaret in 1087 when the mosque was incorporated into the city's boundary. Unfortunately the top sections of these minarets were partly destroyed in an earthquake in 1303 which wrecked the area as well as causing great damage to the mosque. The present heavily corbelled and scalloped towers, which rise out of the heart of the two square salients, belong to the renovation work undertaken after the earthquake by the great Mamluk leader Baybars in 1304. The restoration also extended to a few aisles of the prayer hall which regretfully replaced original damaged pointed arches with horseshoe ones, a feature which destroyed some of the rhythm of these aisles. Many of the remaining parts of the mosque still retain much of their original character; sections of the prayer hall with their piers and arches, for example, as well as the mihrab dome survived almost intact. The walls still retain many of their original features and the entrance and minarets much of their bas-relief floriated Kufic friezes, interlineated upended plaques and decorated string course mouldings. The mosque courtyard or Sahn is a large open area surrounded by a covered arcade (porticoes), three riwaqs deep except from the north western side which is only two riwaqs wide. The boundary walls around the courtyard and on the exterior are surmounted by battlements, a feature which was first introduced to Egypt in Ibn Tulun Mosque and later re-employed in Al-Azhar. This is another motif that was transmitted to Europe, most probably through the influence of mosques of Ibn Tulun, Al-Azhar and Al-Hakim mosques. An example of this is the architect of Palermo Cathedral, built in 1185 CE, who seems to have been so impressed with these battlements that he employed them in the cathedral.